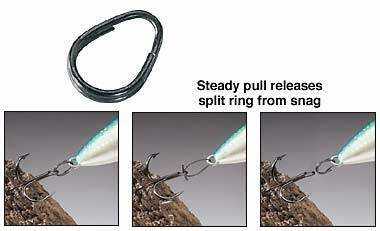 This is an interesting product, basically it is similar to a split ring but designed in a way to open when pulled, the ring opens as it is stretched and then goes back to its intial shape. There are different tension strengths the lightest one is 6lbs. Originally created for quick release of captures when fishing these rings can be used as quick-release split rings for different items such as tools, flashlights etc. Being made of titanium adds an irresistible touch. You can read more in the product page. You can order them starting at $8 from this site. Smarter than a splitring and made of Titanium.